The film is great until Harry is sent packing to San Paulo and then the film drags and goes all forgettable on us. No I dont agree. The movie fails cause its not a good movie. The Callahan character had become tired and cartoonish. ^^^Good point, Perry and I agree. Not at first, because upon release I was happy to experience seeing my first Dirty Harry movie on the big screen as a fan. Unfortunately, this film has not aged well. Cartoonish is a good adjective describing one of the problems. While Sondra Locke was good in The Gauntlet and "Which Way" films, her acting here is bad. Not only that, but constantly revisiting her past is what drags the film down. What I come away with from revisiting this movie these days is nostalgia and satisfaction of seeing Eastwood on film, a rarity these days. What I don't understand about this film is how it's constantly ignored whenever 80's-themed magazines hit the bookstores. Sudden Impact was a mega hit in it's day, a widely successful movie at the box office that had Eastwood in the limelight once again. Not only that, "Make My Day" was an oft-repeated quote, from commercials, other actors all the way up to then President Reagan. I've noticed that whenever a 1980's movie-themed magazine comes out, Sudden Impact is ignored. I wonder why. Outside of that quote and the fact it did make money J.C, I never liked the movie. When i saw it originally I have to admit my first thought was " Jeez, Locke is in this movie too?" so my hatred was in full mode, but I just thought the whole movie was ridiculous and it had become a tired act. Go watch 'The Dead Pool' which is even more embarrassing. The movie Eastwood did that should had got more response as far as 80's movies was 'White Hunter Black Heart' which is a great movie. One last point J.C.. Locke I agree is very good in The Gauntlet, but she's mediocre in anything else she did with Eastwood. I hear ya. I’m not a fan of The Dead Pool anymore but admit I enjoyed seeing it upon first release more than Sudden Impact. Eastwood did start the 90’s off right with White Hunter, Black Heart but slipped with The Rookie before his tour de force two years later, Unforgiven. So Locke was in all of six Eastwood movies, her best performance being The Gauntlet. I’d say she was at least passable in the Which Way films. At least those two comedies are good enough regardless of her appearance. Her acting is actually better in Bronco Billy, but the Which Way comedies are better films overall. I think the movie was ok (lets face it, how many Eastwood films were bad as in unwatchable?) but I never liked Sondra Locke as an actress and some of the scenes were a bit so-so in the movie, little bit on the gratuitous side. I did like one of the scenes near the end where Dirty Harry is silhouetted with his gun when the 2 bad guys have Locke, that was memorable. The merry-go-round scene is too loooooooong. I actually didn't mind "Sudden Impact" being set away from San Francisco. I think that "Sudden Impact" was one of the lesser "Dirty Harry" efforts because it was tonally inconsistent from the rest of the series. It was far too dark, and quite downbeat and Sondra Locke was really not a good choice for the vigilante role. Her only good performance in an Eastwood film was in "The Gauntlet." In my opinion, the film also thematically didn't fit in well with the rest of the series since in "Magnum Force" Dirty Harry led the charge to bring the vigilante cops to justice while in this film, he lets the vigilante go and arguably aids in covering up her crimes. That never made any sense to me. It did not seem true to the values "Dirty Harry" lived by. On the other hand, it did have it's high points too. It did give us "Make My Day," and that iconic photo of Dirty Harry in silhouette by the merry-go-round! Best parts of The Enforcer are Eastwood's scenes with Albert Popwell. For me, the first 3 Dirty Harry stand alone the strongest in the series, a perfect trilogy. Time has not been good to Sudden Impact, but justifiably so. Regardless, it holds a special place in my heart because it’s the first Dirty Harry film I’d seen on the big screen upon initial release. I saw it twice and remember enjoying it very much both times. In my opinion, the best Dirty Harry movie is the original one, directed by Don Siegel. Clint Eastwood’s performance is still one of his best. Andy Robinson’s performance is good too. The cat and mouse game is convincing and memorable. The music, the atmosphere reflect so well the era of the 70’s. The Dead Pool and The Enforcer are the weakest movies because of the lazy and not so convincing stories. Even Clint seemed to be bored with his character. Magnum Force is interesting because it seems to be an answer to Pauline Kael, who disliked the Don Siegel film and wrote a very bad review on it. Clint’s performance in Magnum Force is still good and convincing. In Dirty Harry, we just see Harry Callahan at work. Harry’s private life is more developped in Magnum Force. Sudden Impact is different from the other sequels. Sudden Impact can even stand alone. Is Sudden Impact a failure ? And why ? I don’t think that Sudden Impact is really a failure. I think that in many ways, Clint enters in the 80’s with Sudden Impact and Firefox. Of course, Bronco Billy and Honkytonk Man were released in the 80´s too but belong to the 70’s. I mean that these movies have the spirit of the 70’s. 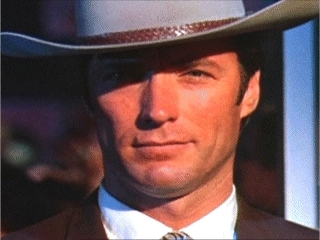 When Clint did Sudden Impact, he played with his audience and obviously, Clint knows very well his audience. In the first half, he gave his audience what the audience expected from a traditional Clint Eastwood movie: punch lines, action sequences, shootouts. In the second half, Clint walked the audience to his personal universe: the San Paulo part, the flashbacks and the great final which is reminiscent of movies like a Fistful of Dollars and High Plains Drifter. In the end, Harry became a vengeful ghost in many ways. I think that the second half of Sudden Impact announces Tightrope, which is often considered as a better movie than Sudden Impact. Bruce Surtees photography is good, the Lalo Schifrin music almost became funk music. Like in The Gauntlet and Tightrope, Clint had a conversation with his own character in Sudden Impact. Sudden Impact is darker and more depressing than the other sequels. The Roberta Flack song, This Side of Forever, is beautiful and melancholic at the same time. Sudden Impact may not be perfect but is one of the most interesting Dirty Harry sequels because Clint put his character out of his comfort zone. So, I wouldn’t say that Sudden Impact is a failure artistically speaking. Clint is aware of his audience and his screen persona. and leads us to The Mule. Well, if you remember, near the end of Sudden Impact, Harry Callahan was seriously beaten up by Mick and his two buddies. Then, Harry fell into the ocean. The three villains let Harry and they were satisfied, thinking he was drowned. Of course, the audience knew that Harry survived because one scene showed Harry coming out of the water, injured but still living. He went to his hotel room and found his friend Horace dead. He took his 44 Magnum Automag. When Harry appeared in the end, after the carrousel sequence, the three villains looked at him like he was a ghost. They were terrified. Because they thought that Harry was dead. It’s like in the end of A Fistful of Dollars, when the Man with No Name appeared in order to save Silvanito from Ramon and his gang. Symbolically, it’s like a resurrection. The light, the music and the sound effects went that way too. The audience doesn’t want Harry/Clint Eastwood to be killed off. The end of Sudden Impact symbolically represents the fantasy of the audience: the audience wanted Jennifer Spencer to be saved by Harry and they wanted the villains to be punished by Harry as well. This is how Clint plays with his audience and with his character. By the way, the Sudden Impact ending is better than the other Dirty Harry sequels endings, Magnum Force included. Thanks for another great observation, Hocine! You also mention High Plains Drifter. I think the Sudden Impact ending is even more reminiscent of that. Sudden Impact and High Plains Drifter endings almost have horror film atmosphere. In many films, Clint Eastwood’s characters make some appearances as if they were supernatural beings. For instance, in A Fistful of Dollars, Dirty Harry, High Plains Drifter, The Outlaw Josey Wales, Sudden Impact, Pale Rider, Unforgiven, Absolute Power and Gran Torino. Clint Eastwood made some iconic and beautiful shots. KC, I had never associated those two images from HPD and “Sudden Impact” with each other before, but you are so right! You can really see Eastwood’s directorial hand at work in those images. Hocine, I’ve never thought of Callahan in “Sudden Impact” as an avenging angel, but the way you explain it, it makes total sense to me now. KC, Hocine seems to be interested in symbolism. He really reminds me of Xichado, who doesn’t post anymore, but who always made interesting and thought-provoking posts here.